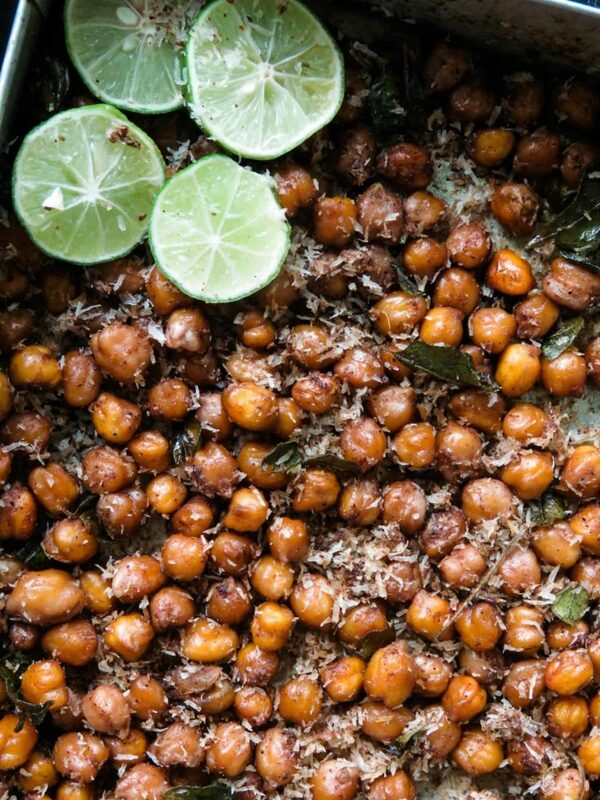 healthy oven-roasted curry chickpeas can be a snack, breakfast or topped over a simple meal. add a pinch of homemade garam masala to give these easy chickpeas a curry flavor you’ll enjoy. Here’s an easy recipe for all you chickpea fans out there. 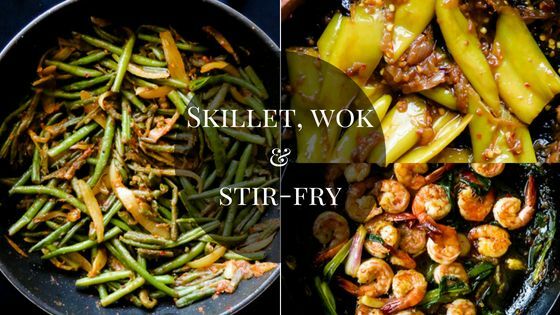 These legumes can be adapted to almost any cuisine and goes almost with anything from combining other vegetables to meat. But for this healthy version of a feel-good snack, I’m keeping it simple. 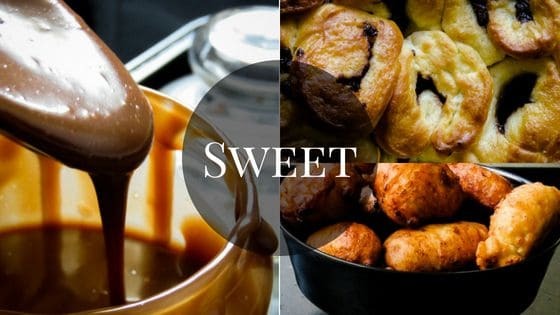 So simple that all you need is a baking pan of any kind to assemble and oven roast until they become crunchy enough to suit your taste buds. This snack was breakfast for my kids when all I had was these raw chickpeas and half a bag of dessicated coconut before going on my weekly marketing. All I had to do was soak the raw chickpeas overnight and spend a few minutes in the morning roasting them in the oven. 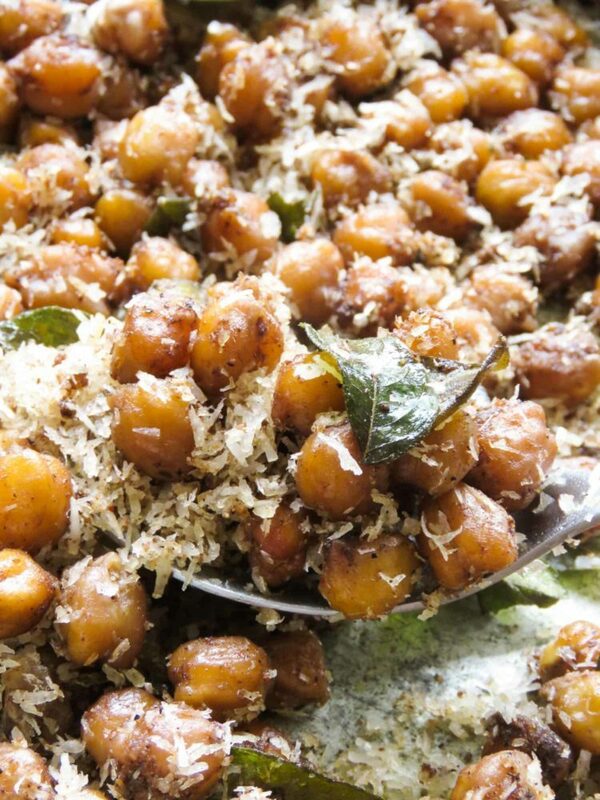 curry chickpeas with coconut flakes. 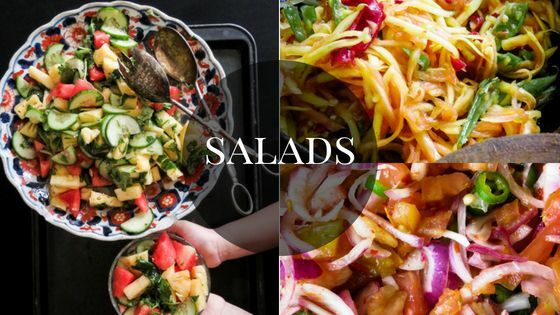 Do you need a time to munch on these healthy bites? I don’t think so. 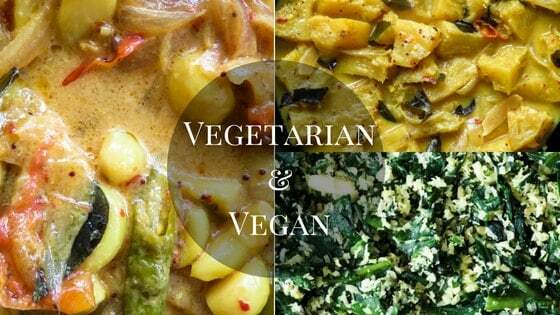 they make a meal any time of the day, add a salad or a portion of meat if you want to have a complete meal. If you really don’t have the time to soak the chickpeas overnight, have a few canned chickpeas in hand, I guarantee you’ll make use of them. I’m using a pinch of garam masala to season these chickpeas, please be careful and only add a really small amount, you want the spice mix to enhance the chickpea flavors and the coconut flakes. Add too much and you’ll definitely taste a slight bitterness in the chickpeas. You will need a bowl to mix the ingredients and a medium-sized baking pan to roast the chickpeas. need for a single serve? Even in small quantity, cooked or roasted, chickpeas can be quite filling. These legumes come in 5oog packs which can be too much even for a family of five. before you even begin soaking the chickpeas, decide how much of the legumes you’ll need. Depending on how much a person would actually eat per serving, I would suggest half to 1 cup per serving(the latter quantity if she or he is a big eater). although not accurate, the above estimate should give you an idea of how much chickpeas you’ll need to cook. Place the chickpeas in a large bowl and pour in water to submerge the legumes, keeping in mind that chickpeas increase in size as they soak for a long time in the water, make sure to use a large bowl and extra water. Once the chickpeas have been soaking overnight, drain them, rinse over running water, let them drain completely and then use for any recipes that need chickpeas. 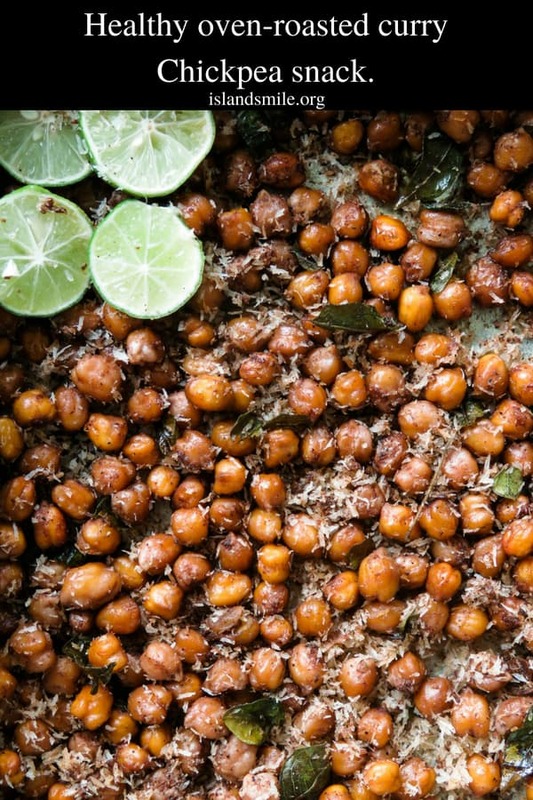 recipe- healthy oven-roasted curry chickpea snack. Read notes on how to prepare raw chickpeas for cooking and follow instructions before following the next step. make sure the chickpeas are completely drained and ready. In a large bowl mix in the chickpeas, garlic, chilli powder,garam masala. Pour in the oil and season the ingredients in the bowl with salt. Keeping in mind that you’ll be adding a bit of lime juice at the end. these two ingredients(salt and lime)should be used in moderate so that the taste of the chickpea is balanced rather than overly tart or salty. Add the chickpeas to a baking pan, spread out evenly and bake for 10-12 minutes or until they slightly brown. 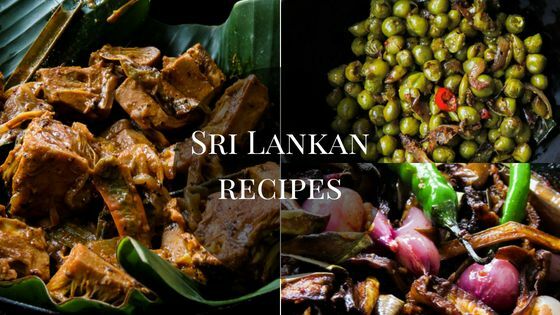 Once 10-12 minutes of baking time is done, spread the coconut flakes over the roasted chickpeas, place the baking pan into the oven, continue roasting both the chickpeas and coconut flakes for further 5 minutes. Garnish with a few lime wedges and serve warm. Recipes with chickpeas you might want to try. Breakfast skillet of poached eggs in tomato sauce and chickpeas. 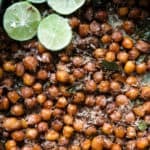 HEALTHY OVEN-ROASTED CURRY CHICKPEAS- CAN BE A SNACK, BREAKFAST OR TOPPED OVER A SIMPLE MEAL. ADD A PINCH OF HOMEMADE GARAM MASALA TO GIVE THESE EASY CHICKPEAS A CURRY FLAVOR YOU’LL ENJOY. I’ve been looking for a way to cook the chickpeas that my wife accidentally bought at the grocery. Now I can make something new for the family to try. Thanks for this!